"Maraaya" consist of vocalist/writer Marjetka and producer/writer Raay. Raay and Marjetka are a married couple for five years raising two sons, writing songs, creating music and developing their own style in indie/pop music with some elements of soul. Aleš Vovk - Raay (born 7 July 1984) is one of the most productive and successful Slovenian authors and producers, his catalog of more than ten years of work includes over 300 songs. He has collaborated with various Slovenian artists, including composing Slovenian entry in Eurovision 2014 "Round and Round" by Tinkara Kovač, Tina Maze, Nuša Derendo, and others. He has been involved in 7 EMA entries of the past years: Maja Slatinšek (2004, 6th), Žana (2004, SF), Manca Špik (2008, 9th), Turbo Angels (2008, 6th), TAngels (2010, 12th), Saša Zamernik (2010, SF), April (2011, 2nd). Raay was also a judge on the show Misija Evrovizija (2012 National final). Marjetka started as a studio session singer, where she had a chance to work for different artists and experience different music styles. While also being a vocal coach to youngsters teaching them modern pop technique, she had developed her own distinctive soulful vocal style. Marjetka and Raay are already sang together in 2005-2009 in the band Turbo Angels (took part in EMa in 2008 with "Zabava" finishing 6th), and it's spin-off TAngels (took part in EMA 2010 with "Kaj in kam" finishing 12th). "Maraaya" are currently working on their debut album. First single from it was song "Lovin' Me", released in April 2014 in Slovenia and subsequently abroad: in Italy, Belgium, Poland, Germany-Austria-Switzerland and Spain. It was featured in several hit compilations, such as Bravo Hits - Winter 2015, climbed to 4th place on the iTunes pop charts in Belgium and 9th place in Italy, got to German Dance Charts, and was rotated by Italian Radio 105 and RTL 102.5). In November Maraaya have been featured on track "Rain in Your Eyes" of LukeAT. Also was released Avicii cover on "Wake Me Up". The duet were co-writers and part of the team supporting and managing first Slovenian Junior Eurovision representative Ula Ložar with "Nisi sam / Your light". 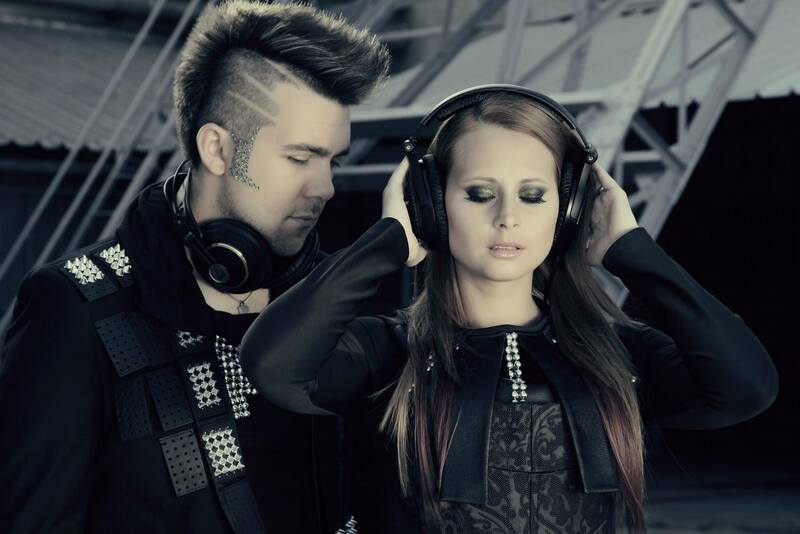 Maraaya together with Ula have recorded cover on "Rise Like A Phonix", ESC 2014 winning entry. "Here For You", Eurovision entry, was chosen from 4 singles already prepared for the upcoming EP of the duo. The singles are scheduled to be released within the next 2 years. Maraaya have consulted various Eurovision experts and fans in order to choose the right single and finally has decided over "Here For You". The lyrics for the song were written by Charlie Mason, who is also behind last year's winning entry "Rise Like A Phoenix", Italian entry 2012 and this year's English version of Serbian entry. Even prior to the EMA victory the song was scheduled for release on Italian indie record label "Dance & Love" in March. "The most important thing is Marjetka's distinctive vocal, the song isn't a ballad nor a party song. I would describe it as a mysterious indie-pop song with catchy melody and a bit alternative-pop production with soulful elements, may be with a taste of neo-soul"
Andrej Hofer will be commenting on the Eurovision 2015 from the studio in Ljubljana. Our next guests are Marjetka and Raay who together form duet Maraaya from Slovenia. We have already met them during Junior Eurovision 2014 in Malta and are now happy to talk again about their Eurovision Song Contest 2015 preparations. "We have been in the Zombieland regarding the tight schedule for 3 years now… one less hour to sleep makes no difference", jokes Marjetka. "Its fun and we can't wait to go to Vienna to perform this on the big stage". "It's cool having the first ever Slovenian “ESC” hat-trick after last years Tinkara and Ula at Junior ESC and now Maraaya", adds Raay, who has already attended ESC 2014 in Copenhagen and JESC 2014 in Malta. "At Malta was great as we were both part of delegation but in Copenhagen Marjetka stayed home with 2nd born child as he was to young so she hasn't yet experienced the majority of ESC. It will definitely be much easier! And we both already have the accreditation photo from Malta, imagine that! ", he laughs. The duet will represent Slovenia with "Here For You", which Raay describes as "an Indie-pop flavored song it's catchy, it's different, it's not as Eurovisionish as one would expect". 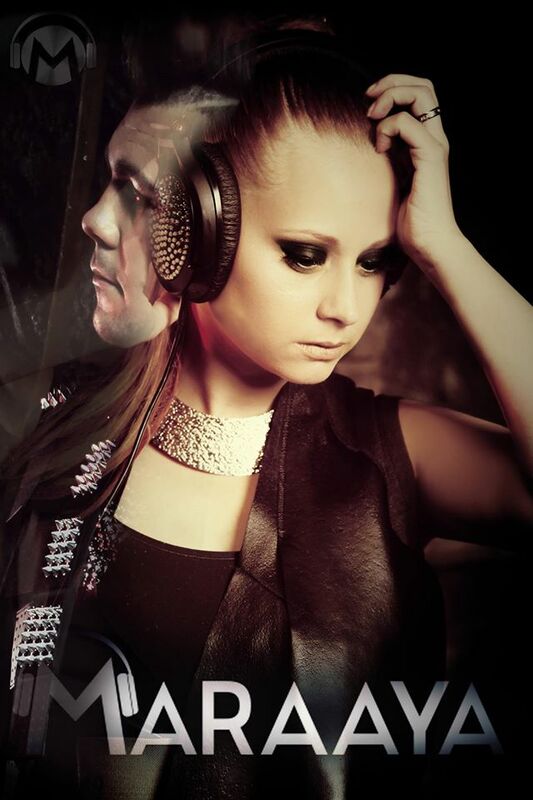 He adds that his inspiration for the whole project is coming from the amazing vocals of Marjetka. "It's actually great combination of melody, vocal and production that seems as an alternative to Eurovision pop that we usually hear", she says in her turn. "Here For You" was aimed as one of the duet's singles to be released withing next 2 years. "In big discretion we asked over 100 people (friends, family, musicians, ESC fans, bloggers) to give their "chart" about choruses from 4 potential entries. And "Here for you" won the majority so it became our Eurovision entry and the 3rd one with best rates will be our next single", laughs Raay. Originally, there was longer version of the track recorded, and for Eurovision Raay has cut out the instrumental hook #2 and cut out half of last chorus creating it in the “vocal” finale that is not on the studio version. There are no further changes in the song planned. "Digitally the song will be released on worldwide basis probably before the ESC and our main label in Italy is already planning the releases also in other countries so we hope to continue the successful story of Lovin' me, our first single", says Marjetka. There are plenty of ideas for the extra versions projects and Maraaya are hopeful to get enough time to realize them. They are thinking on recording Slovenian version of their entry sang by JESC 2014 representative Ula Ložar in a little different arrangement. Another surprising version already came from Perpetum Jazzile, big vocal sensation from Slovenia, and both bands are in the middle of planning the official studio version and music video together. One of the Slovenian “dalmatia” boyband groups was also invited to do the “dalmatia” version with Croatian lyrics. There are also ideas to record the song in Spanish language. The next step is the release of the music video for the entry. "It was a first time experience for me as in some parts I wore ONLY headhones on myself", laughs Marjetka. "And even I wasn't allowed to be in the studio as she filmed those parts", smiles Raay. "Well of course, as I had to be relaxed and that's why I want only the director of the video to be in the studio. But beside that we have some alternative idea in the video with shadows, projections etc. And of course also the violinist is in the video". An air violinist Lara Slekovec is one of the essential participants of the stage act. This is what Raay had to say about her: "She is amazing girl! Such a charisma. Her stage name BALODIS. I can not stop looking at her with that attitude. I met her as a dancer of April (Ema 2011 superfinalist). We were always thrilled how great her attitude is and we spontaneously got an idea to include her as a violinist on the stage. I mean – first we were thinking of a real violinist, and then the creative director of our performance said: “but it's so freakin' obvious – having the violin IN the song – and having Violinist – ON the stage… “ And he was right". Regarding the plans of the staging of the act at the international final, duet members say there will be improvements, but not turning it upside down. "Obviously we must have done something that touched people over the Europe, ESC fans, Slovenia fans, who talk about the EMA performance, the pretend violin player, the dress, the headphones. And the song came “out”, I think that performance we have now brings out the emotion of the songs, the right feeling and atmosphere of the song". On 1 April, Maraaya are going to Austria for filming of the second part of their postcard. They are also thinking on attending Eurovision In Concert in Amsterdam and some other promotions, but are also busy with preparations inside Slovenia. Band plans to use Eurovision participation first of all to gain some international recognition in countries that they will be releasing the Maraaya project in and to present their music to all the audience of Eurovision. "The result comes second. We have our fingers crossed to get into the finals for Slovenia for 2nd year in a row now but everything is in the hands of people and jury. We hope and believe we can prove that the size of the country doesn't count and we believe that people will listen to the music and not deciding on the popularity of countries"
Speaking on the other competitors in the contest, Raay says: "Mostly we like the songs that stand out a bit, we like the songs that are not “calculative” Eurovision-ish or struggling and competing witch is the highest note the singer could sing but simply do the music. We are always into more radio friendly songs that have a lot of potential also when the final aviso of ESC ends. So maybe Estonia as it is the closest to what we do as well. But there is a lot of good singers. I think our favorites will show up when hearing and seeing everything ON the stage in Vienna". "Hey, ESCKAZ visitors! You all get great information here at ESCKAZ, also about Slovenia & Maraaya so don't forget to check it out now and then – and – cross your fingers and be there for us in Vienna"
You can read complete text of the interview on the Facebook page of OGAE Rest of the World. 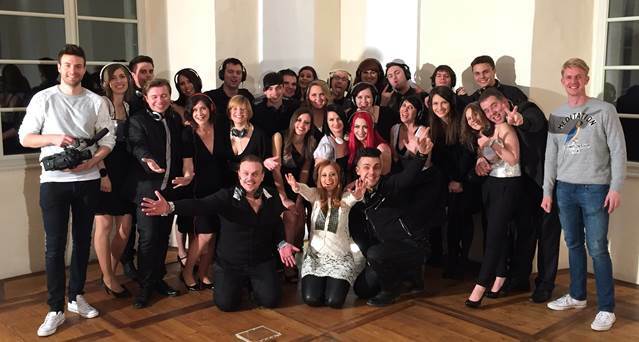 Slovenian 2015 representatives Maraaya have recorded a vocal orchestra version of their Eurovision entry. Perpetuum Jazzile is known as one of the most spectacular and biggest vocal group across the globe, celebrated as YouTube’s most watched large vocal group in the world with well over 48 million views, with mesmerizing vocals-only rendition of Toto’s Africa at the forefront. The critically-acclaimed vocal orchestra heralding from Slovenia, is popular for its powerful rhythms, rich harmonies, unparalleled creativity, and special blend of various music genre. To release the stress a bit, because Eurovision Song Contest in Vienna is fast approaching, Maraaya decided to go to a short family holiday at Adriatic coast. They are accumulating strength for all the surprises they have for the fans in Vienna. 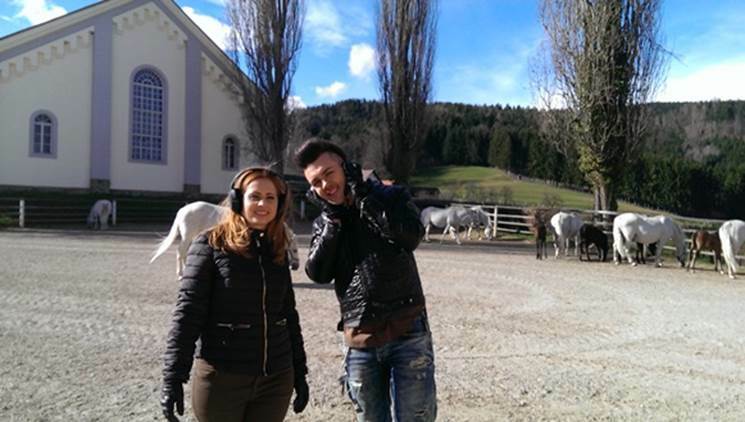 Maraaya had a lot of fun at a beautiful castle in Austrian Piber, where they were shooting the second part of their postcard for ESC. It was very windy, but nonetheless they enjoyed their time in stunning nature, where they were surrounded by such gracious creatures – the Lipizzaner horses. Slovenian Eurovision entry "Here For You" has got it's visual upgrade. Filming of the music video was made in one day in the studio on the outskirts of Ljubljana. Just as the music videos for Hannah's "Straight into Love" and Tinkara Kovač' "Round And Round" the video has been directed by Niko Karo. Everything in the video is based on aesthetics. "The projection is very interesting. I am projected to Marjetka, so we're never in the same place," says Raay. Organizers of the Eurovision Song Contest 2015 has started international promotion of the event, which will included presentation of the show and it's "Building Bridges" concept in 15 largest European cities. First evening of this kind was held in Slovenian capital of Ljubljana, where at the special press-conference were able to meet Slovenian entrants Maraaya and Austrian entrants The Makemakes. Subsequent reception took place at the City Museum, where both groups have performed their entries. Watch the video from the event here, performance by Maraaya of The Makemakes song here. "We are very excited and can not wait for it to go to Vienna for the Eurovision. We put all our emotions in our song and hope that the audience feels what we feel about it - there always is is someone who is there for you. For us, the ESC is not just a competition. We want to find out as many friends as possible. The meeting with The Makemakes today was a great first bridge we could build. Vienna is a really magical city that we like a lot"
Less than a week after winning EMA Maraaya have already filmed first part of their Eurovision postcard. "Each country gets a package and the procedure is documented by the Austrian filming crew. The second part of the postcard we will record in Vienna. On the first of April. And this is not a joke," laughs Raay. Postman, delivering the parcel was played by EMA host Nejc Šmit. The couple, who will represent Slovenia at the ESC 2015, this week also dealt with the decisions of who will be included in their team for the performance in Vienna. At EMA the backing vocals were sang by Lea Sirk and Karin Zemljič. "The team will remain mostly unchanged, besides Lea, who is heavily pregnant and thus will remain at home," explained Raay. Meanwhile, "Here For You" has topped chart of the most played songs in Slovenian Radio stations. Similar success was achieved last year by Tinkara Kovač with the Slovenian version of the winning song. At the end of the year it was the most played song in Slovenian. On the rating of Slovenian Association SAZAS the song has finished on 7th place. 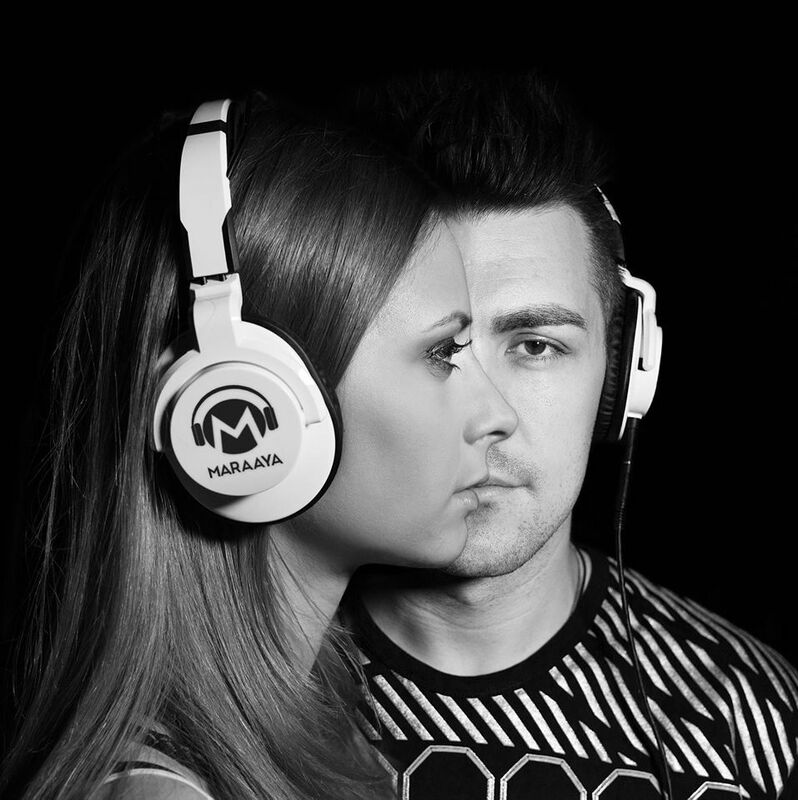 In an interview with Slovenske Novice Maraaya members have spoken about the trademark headphones and plans of staging of the song "Here For You" on Eurovision stage in general. "Headphones are part of the story and they bring musical message. The are symbol of my private space, I conjure up a whole world in that little space and get feeling that I have in the music studio where I record my songs. While performing it helps to bring bigger emotions with the voice feeling every single note, it is crucial psychological moment. I never knew how to attempt bringing feelings from the studio to the stage, but Raay told me to try the headset from the studio in appearances. Now it's our trademark. I use a large male headphones"
Marjetka says that for sure headphones will remain part of the performance at Eurovision, and they will be white ones. She plans to bring to Vienna two dresses: one in which she has already performed at EMA and that got quite positive reviews, and the other one similar. Both dresses will be tested during the dress rehearsals. "Dressed in white, I feel better the message of the song. Dress was created by Vesna Mirtelj, taking into account what would I like to wear. The dress is done very precisely, because it is fastened to the neck, the arms and the legs, something that can be considered a bit conservative approach, but still can look seductive and attractive. Above all, I think that the outfit should not detract from the song. In the first place should always be the song and the music, and everything else is just adapted to substantiate this, but not to take away attention"
There are still some adaptations planned for a Vienna performance, because the stage in Stadthalle will be larger, and there are more possibilities for the special camera and light effects. There will be some improvement in the performance of violinist, especially in setting up and light, to increase her artistic input. "Despite minimalism, people have instantly remembered at least three specific things from the performance: unusual voice of the singer, her headphones and violinist without the violin. We have never dreamt of getting such a good response, since the staging has been created rather spontaneously"
Responses have been really good, especially from Eurovision fans, say Maraaya members, however, they admit that everyone agree on the fact that Slovenia is a small country and often overlooked at Eurovision. Yet, the duo plans to work hard to get noticed with their stage performance, and keeping fingers crossed that the judgement will be based first of all on song qualities. Maraaya have released short trailer for the upcoming "Here For You" music video. 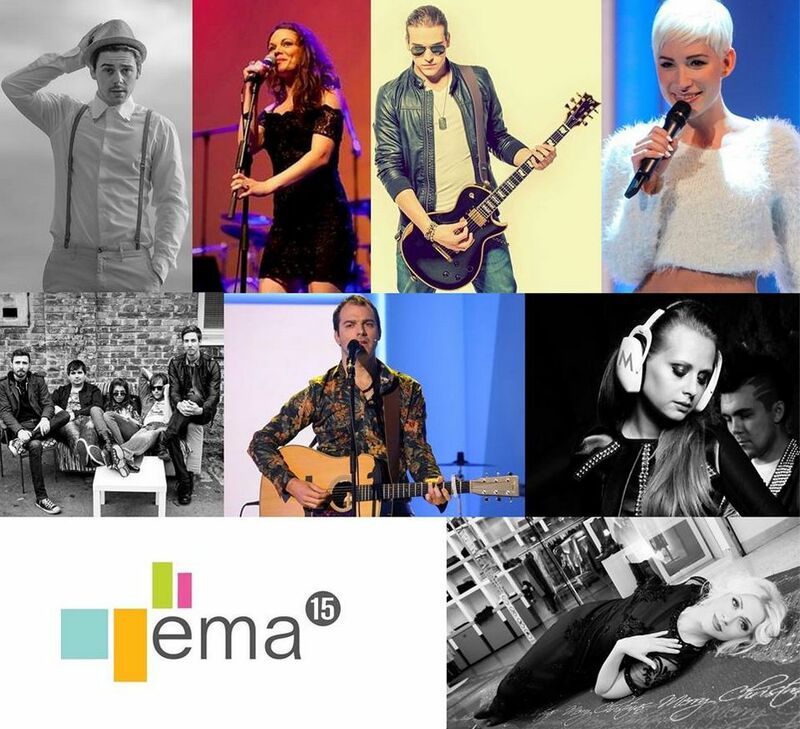 19th edition of "EMA" show will select Slovenian Eurovision entry for Eurovision Song Contest 2015. The show final will be broadcasted on TV Slovenija 1 on 28 February 2015 at 20:00 CET live from RTVSlo Studio 1. Additional greenroom online stream will be offered on rtvslo.si. Hosts of the EMA: Darja Švajger​; Maja Keuc​, Tinkara Kovac​, Nejc Šmit. 8 songs will compete in a televised show, 3-member professional jury (equal to female hosts of the show) (voting on 1-2-3-4-5 system) will select 2 superfinalists and then public televoting will solely determine the winner. Ties in jury vote will be broken giving priority to the song that achieved a higher number of top scores, followed by each juror indicating their preferred song should a tie still persist. "Maraaya" состоит из вокалистки Марьетки и продюсера Рэя. Рэй и Марьетка женаты уже пять лет, растят двоих сыновей, пишут песни, создают музыку и развивают собственный стиль в направлении инди/поп с элементами соула. Алеш Вовк - Raay (родился 7 июля 1984 года) один из наиболее продуктивных словенских авторов и продюсеров, каталог его работ за последние 10 лет включает в себя свыше 300 песен. Он сотрудничал с различными словенскими артистами, в частности был автором песни Словении на Евровидении 2014 "Round and Round" Тинкары Ковач, с Тиной Мазе, Нушей Дерендой, и др. Он также принимал участие в создании 7 песен национальных отборов EMA в прошлые годы: Майя Слатиншек (2004, 6е место), Жана (2004, полуфинал), Манца Шпик (2008, 9 место), Turbo Angels (2008, 6е), TAngels (2010, 12е), Саш Замерник (2010, полуфинал), April (2011, 2е место). Рэй также был членом жюри в отборе Misija Evrovizija (национальном финале 2012 года). Марьетка Вовк начинала свою карьеру в качестве студийной сессионной певицы, получив возможность поработать с различными артистами и стилями музыки. Являясь педагогом по вокалу для детей, обучая их технике современного поп-вокала, она развила собственный вокальный стиль, близкий к направлению соул. Марьетка и Рэй уже выступали вместе в 2005-2009 годах в группе Turbo Angels (принимала участие в EMA в 2008 году с "Zabava", заняв 6е место), и ее новом составе TAngels (принимали участие в EMA 2010 с "Kaj in kam" заняв 12е место). "Maraaya" в настоящее время работают над своим дебютным альбомом. Первым синглом с него стала песня "Lovin' Me", выпущенная в апреле 2014 года в Словении, и впоследствии зарубежом: в Италии, Бельгии, Польше, Германии-Австрии-Швейцарии и Испании. Она вошла в ряд популярных сборников, например Bravo Hits - Зима 2015, достигла 4й строчки в iTunes поп чарте Бельгии и 9й в Италии, попала в Немецкий танцевальный чарт, и ротировалась на итальянских радиостанциях Radio 105 и RTL 102.5). В ноябре Maraaya приняли участие в записи трека "Rain in Your Eyes" певца LukeAT. Также был выпущен кавер на трек Avicii "Wake Me Up". Дуэт также являлся соавторами песни и продюсерами первой представительницы Словении на Детском Евровидении 2014 Улы Ложар, исполнившей "Nisi sam / Your light". Вместе с Улой Maraaya выпустили кавер-версию на песню-победительницу конкурса 2014 года "Rise Like A Phonix". "Here For You", конкурсная песня для Евровидения, была выбрана из 4х синглов, уже подготовленных для предстоящего альбома дуэта. Ожидается, что эти синглы будут выпускаться на протяжении ближайших двух лет. Maraaya связались с различными экспертами по Евровидению и поклонниками конкурса, для того, чтобы им помогли выбрать лучший возможный вариант, и в итоге решили отдать свое предпочтение "Here For You". Текст песни написал Чарли Мэйсон, являвшийся автором текста прошлогодней песни-победительницы "Rise Like A Phoenix", итальянской песни 2012 года и английской версии песни Сербии этого года. Еще до победы на EMA, у песни был запланирован мартовский релиз в Италии на инди-лейбле "Dance & Love". "Наиболее важным элементом песни является отличительный вокал Марьетки. О самой композиции нельзя сказать, что она баллада, или наоборот песня для вечеринок. Я бы описал ее как загадочную инди-поп песню с запоминающейся мелодией, и немного альтернативным поп-продакшеном с элементами соула, возможно с небольшим привкусом нео-соула"
Андрей Хофер будет комментировать Евровидение 2015 из студии в Любляне. Наши следующие гости - Марьетка и Рээй из Словении, которые вместе выступают как дуэт Maraaya. Мы уже встречались с ними на Детском Евровидении 2014 и были рады побеседовать снова об их подготовке к конкурсу Евровидение 2015. "Мы и так уже три года живем как в Зомбиленде, что касается нашего графика… потому то, что с поездкой на Евровидение у нас стало еще одним часом меньше сна - это не такая уж и большая разница", шутит Марьетка. "Евровидение - это всегда большая забава, и мы не можем дождаться нашей поездки в Вену и выступления на большой сцене". "Классно, что у нас вышел своего рода первый словенский "хет-трик", после участия с Тинкарой и Улой на Детском Евровидении, а теперь с Maraaya", добавляет Рээй, который уже посещал Евровидение 2014 в Копенгагене и Детское Евровидение на Мальте. "На Мальте было веселее, потому что мы оба вместе входили в состав делегации, а в Копенгаген Марьетка не смогла поехать, потому что у нас недавно родился второй ребенок, и потому она еще толком не видела взрослого Евровидения. Но теперь нам будет все равно намного легче! И у нас уже обоих есть аккредитационные бэйджи с Мальты, представь себе! ", смеется он. Дуэт представит Словению на конкурсе с песней "Here For You", которую Рээй описывает как "инди-поп композиция, запоминающаяся, выделяющаяся, и не такая Евровизийная, как можно было бы ожидать". Он добавляет, что вдохновением для всего проекта стал неповторимый вокал его жены Марьетки. "В ней замечательная комбинация мелодии, вокала и музыкального продюсирования, и она кажется альтернативой той поп-музыке Евровидения, которую мы обычно слышим", говорит она в свою очередь. "Here For You" изначально планировалась в качестве одного из предстоящих в два ближайшие года синглов дуэта. "В атмосфере огромной секретности, мы опросили свыше 100 человек (друзей, членов семей, музыкантов, фанатов Евровидения, блоггеров) расставить по приоритетности 4 припева от потенциальных конкурсных песен. И, поскольку "Here for you" набрала большее количество голосов, то она станет нашей песней Евровидения. А вот следующим синглом станет та песня, которая заняла третье место в нашем отборе", смеется Рээй. Первоначально была записана длинная версия песни, и специально для Евровидения Рээй вырезал второй инструментальный хук, и половину последнего припева, создав "вокальный" финал, которого не было в студийной версии. Больше вносить каких-либо изменений в песню не планируется. "Мы надеемся, что в цифровом видео песня выйдет до Евровидения по всему миру, а наш лейбл в Италии уже планирует релизы в других странах, поэтому мы надеемся повторить историю успеха Lovin' me, нашего первого сингла", говорит Марьетка. Разработано огромное множество идей выпуска дополнительных версий композиции, и Maraaya надеются, что найдется время реализовать их хотя бы частично. Так, планируется выпустить словенскую версию песни в исполнении представительницы Словении на Детском Евровидении Улы Ложар и с несколько измененной аранжировкой. Еще одна неожиданная версия уже была спета вживую вокальной группой Perpetum Jazzile, и обе группы в настоящее время работают над созданием совместной студийной версии и совместного клипа. Одна из мальчуковых групп была приглашена для записи версии песни на хорватском в стиле "далмация". Также есть идеи записи песни на испанском языке. Следующим шагом станет выпуск видеоклипа на конкурсную песню. "Кое-что в нем было для меня впервые, ведь в нескольких эпизодах из одежды на мне одеты только наушники", смеется Марьетка. "Даже меня не пускали в студию во время их съемки! ", возмущается Рээй. "Ну конечно, ведь мне нужно было быть полностью расслабленной, и потому в студии со мной был только режиссер клипа. Но также мы задействовали в нем некоторые интересные идеи теней, проекций и тп. Конечно же, в клипе появится и скрипачка". "Воздушная" скрипачака Лара Слековец - одна из основных участников сценической постановки. Вот как Рээй отзывается о ней: "Она просто потрясающая девушка! Такая харизма. Ее сценическое имя - BALODIS. Я не могу оторвать от нее глаз. Я впервые познакомился с ней, когда она выступала в качестве танцовщицы у April на отборе EMA 2011 года. Нам всегда очень нравились ее профессиональные качества, отношение к делу, и идея добавить в наш номер ее в качестве скрипачки возникла довольно спонтанно. Я имею в виду, что мы сначала думали об обычной скрипачке. Но потом креативный директор нашего номера сказал, "Знаете, но это же так банально - скрипка в песне и скрипачка на сцене…" И он был прав". Что же касается планов постановки номера для международного финала, участники дуэта говорят о том, что в него будут внесены улучшения, но не стоит ждать, что он изменится коренным образом. "Очевидно, что нам удалось сделать нечто такое, что затронуло людей со всей Европы, поклонников Евровидения, поклонников Словении, которые продолжают обсуждать наш номер, нашу скрипачку без скрипки, платье Марьетки, наушники. Песня "вырвалась наружу", я считаю, что имеющийся номер позволяет показать все ее эмоции, чувства и атмосферу". 1го апреля Maraaya отправятся в Австрию для съемок второй части своей визитки. Они также планируют посетить Eurovision In Concert в Амстердаме, и, возможно, какие-то еще промо мероприятий, но пока также очень заняты и с подготовкой внутри Словении. Группа планирует прежде всего использовать свое участие в Евровидении для того, чтобы заработать себе международную узнаваемость, особенно в странах, где планируется развивать проект Maraaya, а также представить свою музыку всей аудитории Евровидения. "Результат - это вторично. Мы надеемся на то, что Словения второй год подряд попадет в финал, но все находится в руках зрителей и жюри. Мы надеемся и верим в то, что сможем доказать, что размер страны не имеет роли на Евровидении, и верим в то, что люди будут слушать музыку, а не голосовать за популярность стран"
Отвечая на вопрос о других участниках конкурса, Рээй говорит: "Прежде всего нам нравятся песни, которые выделяются, мы любим не песни, которые являются "просчитанной евровизийными" или соревнуются друг с другом по тому насколько высокую ноту может взять их исполнительница, а просто являющиеся хорошей музыкой. Мы всегда выступаем за те песни, которые имеют радийный потенциал, и останутся на плаву даже после окончания Евровидения. Потому, наверное, из всего того, что есть на конкурсе ближе всего к нашим вкусам - песня Эстонии. Но, нужно отметить, что в нем много хороших исполнителей. Я думаю, что мы точнее сможем определиться со своими фаворитами, когда услышим и увидим все номера уже на самой венской сцене". "Привет всем читателям ESCKAZ! Вы уже и так получаете на этом сайте всю информацию из первых рук, в том числе и об участии Словении и Maraaya, потому просто не забывайте открывать его страницы почаще! Болейте за нас и поддерживайте нас в Вене! Представители Словении на Евровидении 2015 Maraaya выпустили версию своей песни Here For You в сопровождении вокального оркестра. Perpetuum Jazzile известны, как одна из наиболее впечатляющих и крупнейших вокальных групп мира, чьи выступления собрали на Youtube свыше 48 миллионов просмотров. Прославились они своей версией песни Тото Africa. Вокальная группа из Словении славится своими мощными ритмами, богатыми гармониями, не имеющим параллелей творчеством, а также особой смесью различных музыкальных жанров. Для того, чтобы немного отдохнуть от стресса приближающегося конкурса Евровидение, Maraaya решили отправиться на короткий семейный праздник на побережье Адриатики. Там они наберутся сил для воплощения всех тех сюрпризов, которые они готовят для своих поклонников в Вене. Maraaya провели хорошо время в прекрасном замке в Пибере, Австрия, где проходила вторая часть съемок открытки для конкурса Евровидения. Было несколько ветренно, но тем не менее, дуэт получил большое удовольствие от времени, проведенного на природе, особенно в окружении таких прекрасных животных - липиццианских лошадей. Словенская песня для Евровидения 2015 "Here For You" получила свое визуальное сопровождение. Съемки видеоклипа прошли на протяжении суток в студии на окраине Любляны. Также как и над видеоклипами на песни Ханны "Straight Into Love" и Тинкары Ковач "Round and Round" режиссером клипа выступил Нико Каро. Все видео базируется на эстетике. "В нем используются интересные проекции, я проецируюсь на Марьетку, и потому мы оба никогда не находимся в одном месте," объясняет Рээй. Организаторы Евровидения 2015 начали промо-кампанию перед конкурсом, которая будет включать в себя презентацию шоу и его концепции "Building Bridges" в 15 крупнейших городах Европы. Первый подобный вечер прошел в столице Словении Любляне, где на специальной пресс-конференции смогли встретиться представители Словении дуэт Maraaya и представители Австрии The Makemakes. Далее состоялся прием в Городском Музее, где обе группы исполнили свои конкурсные песни. Видео со встречи можно увидеть здесь, , исполнение Maraaya песни The Makemakes здесь. "Мы очень рады, и не можем дождаться того момента, когда мы отправимся в Вену для участия в Евровидении. Мы вкладываем в нашу песню все эмоции, и надеемся, что зрители почувствуют то же, что чувствуем и мы - у тебя всегда есть кто-то рядом, кто поддержит тебя, даже в самые сложные времена. Для нас Евровидение, это не только конкурс. Мы хотим завести с его помощью как можно больше друзей. Встреча с The Makemakes стала первым мостом, который мы смогли построить. Вена - это волшебный город, и нам он очень нравится"
Менее чем через неделю после победы на EMA, Maraaya уже снимали первую часть своего посткарда для Евровидения. "Каждая страна получает посылку, и всю эту процедуру снимает съемочная группа из Австрии. Вторая часть визитки будет сниматься в Вене. Туда мы отправимся 1го апреля, и это не шутка," смеется Рээй. Роль почтальона, который доставил посылку, сыграл ведущий EMA Нейц Шмит. Пара, которая представит Словению на Евровидении 2015, также на этой неделе решала вопрос о том, кто войдет в ее сценическую команду для выступления в Вене. На EMA бэк-вокалы исполняли Лея Сирк и Карин Землич. "В основном команда останется неизменной, помимо Леи, которая ждет ребенка и потому останется дома," объяснил Рээй. Тем временем, песня "Here For You" возглавила чарт наиболее популярных песен на словенских радиостанциях. Подобного успеха в прошлом году сразу после отбора добилась и словенская версия песни-победительницы Тинкары Ковач. В конце года она стала самой ротируемой в Словении песней на словенском языке. В рейтинге словенской музыкальной ассоциации SAZAS она заняла 7е место. В интервью Slovenske Novice участники группы Maraaya расказали о своей фишке - наушниках, а также планах постановки номера на песню "Here For You" на сцене Евровидения. "Наушники - это часть истории, которую мы хотим рассказать, и они несут в себе музыкальный месседж. Они - символ личного пространства, я закрываюсь от всего мира в этом маленьком пространстве, и получаю то чувство, которое я испытываю в студии при записи песен. Во время исполнения это помогает достичь лучшей передачи эмоций, прочувствовать голосом каждую ноту, это важный психологический момент. Я никак не могла придумать, как бы мне перенести чувства из студии на сцену, но Рээй посоветовал мне попробовать одевать студийные наушники и во время выступлений. Теперь - это наша визитная карточка. Я использую большие мужские наушники." Марьетка говорит, что без сомнения, наушники останутся частью номера для Евровидения, и они будут белого цвета. С собой Марьетка также планирует привезти два платья - одно в котором она уже выступала на EMA и получила положительные отзывы, и другое похожее. Оба платья будут протестированы во время репетиций конкурса. "В белом платье я лучше чувствую смысл песни. Автором платья является Весна Миртель, которая принимала во внимание мои требования. Платье сделано очень тщательно, оно подогнано к шее, рукам и ногам, что создает несколько консервативный имидж, но в то же время все равно является привлекательным. Прежде всего, я считаю, что платье не должно отвлекать от песни. На первом месте в любом случае должна быть песня и музыка, и все остальное адаптировано для того, чтобы дополнять их, а не забирать на себя внимание"
Для сценического выступления в Вене планируются несколько доработок, поскольку сцена в Штадтхалле будет значительно больше, и также будет больше возможностей для специальных эффектов работы камеры и света. Будут также некоторые изменения в работе скрипачки, особенно в освещении, нацеленные на увеличение ее художественного вклада в номер. "Несмотря на минимализм, зрители сразу же запомнили как минимум три вещи из нашего выступления: необычный голос певицы, ее наушники и скрипачку без скрипки. Мы не могли и мечтать о подобных хороших отзывах, как мы получили, потому что постановка номера была достаточно спонтанной"
Отзывы были действительно весьма хороши, особенно от фанатов Евровидения, говорят участники Maraaya, но при этом все соглашаются, что Словения - маленькая страна и о ней часто забывают при голосовании на Евровидении. Тем не менее, дуэт планирует запомниться своим сценическим выступлением, и надеется на то, что оценка прежде всего будет базироваться на музыкальных качествах песни. Maraaya опубликовали короткое превью предстоящего видеоклипа на конкурсную песню "Here For You". 19й выпуск шоу "EMA" выберет представителя Словении на конкурс Евровидение 2015. Финал шоу выйдет в эфир TV Slovenija 1 28го февраля 2015 года в 22:00 Москвы из 1й студии ТВ Словении. Дополнительно на rtvslo.si будет предлагаться онлайн эфир из гринрума конкурса. Ведущие EMA: Дарья Швайгер, Майя Кеуц, Тинкара Ковачи и Нейц Шмит. Восемь песен примут участие в телевизионном шоу, экспертное жюри из трех членов (они же - три ведущие шоу) (голосующее по системе 1-2-3-4-5) выберет двух суперфиналистов и затем телезрители определят лучшего из них, который и представит Словению на Евровидении 2015. При равенстве баллов в жюри преимущество будет отдано той песне, которая получит наибольшее количество высших баллов, если и это число будет равным, то члены жюри должны будут переголосовать за своего фаворита из песен с равным количеством баллов. И мы поймали прилив, и теперь мы вновь оживлены. Ты позволишь мне излечить твою болящую душу. Не смогу ли я открыть твои глаза?